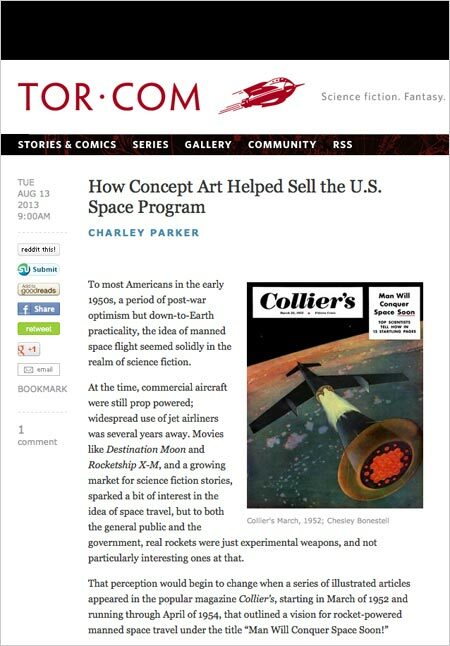 I’ve written new article for Tor.com titled “How Concept Art Helped Sell the U.S. Space Program“. In it, I of course explain what I mean by the title, showcase some terrific space art by Chesley Bonestell, Fred Freeman and Rolf Klep, and link to a source for more. You can see my previous articles for Tor.com here. worked on projects like X-Men Origins: Wolverine, Singularity, Black Ops and Modern Warfare 3. Though he is prevented by non-disclosure agreements from posting his most recent work, his blog features an array of past work, along with personal projects, sketches from life and other images. You can also find a selection of his work on an alternate blog and his gallery on CGHub. I particularly like his use of controlled color ranges, the painterly effects he achieves in faces in his digital paintings, and the way he has extended his range of techniques with digital studies of paintings by masters like Rembrandt and Sargent. Though I’ve never had much of an eye for fashion, I do have an appreciation for fashion illustration, which sometimes shares some characteristics with comic book illustration, in that it has often been done in line or line filled with tone or color. Unfortunately, advances in newspaper printing technology, which permitted improved reproduction of photography, largely displaced the most common uses for fashion drawing in newspaper advertising over the last 20 years or so. It’s always good to see that the art is still alive in certain quarters, often with a more modern take on the venerable forms of rendering. Lidia Luna has an approach that uses a fine or disappearing line, in fine point pen or pencil, with subtle rendering in watercolor. Her renderings of models wearing haute couture take a minimalist approach to the presentation of faces, with forms suggested by soft gradations at key edges, and focus the detail on the clothing, as is expected in fashion illustration. She has a website with a selection of renderings (arranged by project, note the “Next Project” links at the top of the pages), and a blog with more images, as well as sketches and other subjects. There is a brief interview with Luna on Couture Troopers, but it doesn’t delve into technique. In the metropolitan Museum of Art. Use “Fullscreen” link and Download arrow. The outside dimentions of the sheet on which the etching is printed are roughly 12 1/2 x 7 1/2 inches (29 x 19 cm). Another example of that wonderful quality of line that only seems possible with an etching needle. Here, Mortimer has supplemented traditional hatching with dense wavering cross hatching in the darkest areas and areas of stipple in the (weirdly demonic) faces. William Nicholson was a British painter, engraver, lithographer and illustrator noted for his portraits of well known individuals, along with landscapes and still life. I find his still life paintings particularly appealing. Their subjects, sometimes a bit unusual, are rendered with a painterly touch and an eye to soft contrasts of value and color. Contre temps is a beautifully designed and wonderfully realized short (8 minute) animated film that was the graduation project of a group of talented French animation students. It uses 2-D backgrounds and 3-D animation that has been given a hand-drawn feeling. Contretemps, when used as a single word, means an unexpected or inopportune event. When the two words are used separately in their original French, as they are in the title, they mean “against time”. Here, I think, both contexts are relevant. The film has a website with a gallery of concept and production art. You can follow links on the Contacts page to the websites of the creators to see more — particularly matte painting and background design by Jérémi Boutelet and Tristan Menard.